The ScareFest is the biggest Horror and Paranormal Convention in the USA where you will be able to experience three days of the strange, weird and macabre opening September 30-October 2, 2016. Come and meet your favorite celebrities in the horror and paranormal community. Our fans have made it possible for ScareFest to grow into its ninth annual year bigger and better than ever. Spend hours shopping through the huge 82,000 square foot dealer room where over 200 vendors will be selling weird, strange, unique and extraordinary horror and paranormal items. During your three day adventure you will be able to attend many seminars, Q&A sessions, panels and workshops presented by celebrities and speakers at ScareFest. And it doesn't stop there! Before and after-hour events will include Costume Ball, Film Festival, VIP Party for the Platinum and Golden ticket holders, horror movies at the Kentucky Theater, Seance, Ghost Hunts, and other events to be announced. Tickets are now on sale. 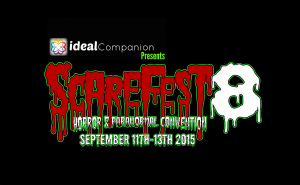 The ScareFest is owned by Patti Starr, President of the Ghost Chasers International, Inc. The ScareFest will be held at the Lexington Center, a state of the art facility and one of the largest convention centers in the state of Kentucky with an abundance of parking on site. Follow us on FaceBook and learn about the updates, contests, and the addition of more stars and guests....Pass it on to friends. Have a question? Please visit our FAQ page here! © 2019 ShowClix on behalf of Scarefest. All sales are final. Tickets are non-refundable.